I haven’t owned a handheld since the Nintendo DS Lite was first released. I got the white one along with New Super Mario Bros. A few games purchased here and there and soon enough I was trading the system in. I just lost any interest I may have once had in the platform. I’ve never owned a PSP and have had no desire to play the games released on the system. Yet the 3DS and Vita are starting to tug at my purse strings. Why? While I have had an iPhone and currently rock a DroidX, I don’t game much on my phone. Every once in a while I’ll pull the phone out to get a quick game in. Usually these moments happen when I’m waiting in line for something, at the Dr.’s office, or when my wife is in control of the TV and watching something like the Bachelor. So I wouldn’t consider myself a huge mobile gamer at all. In fact, I never have been. The first Game Boy I owned was arguably the best version of the system, the Game Boy Advance SP. The laptop-like system was the perfect size, had great Super Nintendo-like graphics, and had really great games like the Golden Sun series. I played that system a lot but I really didn’t have any consoles at the time. It was the only way I was gaming. Admittedly, I had no interest whatsoever in the 3DS when it was first announced and I’m still not altogether interested in the 3D aspect of the system that much. It’s neat but constant headaches would definitely be in my future. (Whereas I don’t mind being sore after playing Kinect, I am not a fan of headaches.) Thankfully there is a slider control that would help me avoid that malady. The main issue was a lack of quality in the games available. Actually, there still is a lack of quality in the software but things are looking up for the 3DS. Even though my first impressions of Super Mario 3D Land (the 3D should go after Land) weren’t very good, I’m starting to come around on the title. Maybe it’s because I have what some might call a deep and unsettling love for Mario, or maybe I just want another game to help justify the purchase of the system. The main reason for my lust is Mario Kart 7. I don't think that glider will hold Donkey in the air. That deep, unsettling love I had for Mario goes way deeper for his karts. I even bought the Gamecube to play the awful (in my opinion) Double Dash. But I never purchased the Wii version and I think taking a break from all things karting might be what is driving my desire for the new game. Not to mention the fact that you can use a hang glider and go underwater. Sure, they might be stupid gimmicks, but I’m usually a sucker for Nintendo gimmicks as evidenced by my purchases over their last 30 years. There are other games in the pipeline that I’m interested in as well like Luigi’s Mansion 2 (mostly for my wife, some more justification). And I would more than likely pick up The Legend of Zelda: Ocarina of Time 3D. So that would four games I’d want to play right at purchase and that’s more than I ever bought for the DS Lite. The only thing holding me back now is that I just don’t know when I would find the time to play. It probably would take the place of watching funny internet videos as I fall asleep, which would be fine with me. More gaming is always a good thing. However, could I live with just buying the 3DS? As I mentioned before, I had no interest in the PSP. I didn’t want to play what basically amounted to PS2 games. Nothing excited me about the PSP. Not the numerous redesigns or any of the games. However, the Vita seems like a cool piece of technology. The ability to have PS3 like graphics with a touchscreen and touch panels on the back have me excited for the possibilities. I’m not exactly sure what it all can do but the unknown is almost always better than the facts. Right now, the Vita is a glorious machine in my mind. Oh, and there’s going to be an Uncharted game on the system. If it can capture the same style and gameplay as the console versions then it will be hard to resist the temptation. Uncharted won’t be enough to sell the system to me…it’ll be close but I’ll need some more evidence to help support my justification. 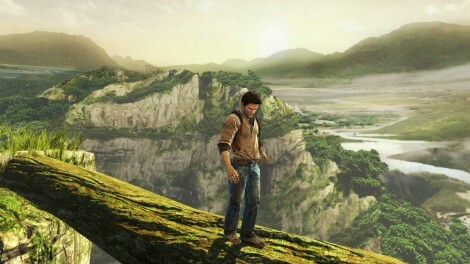 Just like Drake crossing this log, I'm unsure about the Vita. But what is a grown man doing with a PlayStation Vita? I always felt like the PSP was a child’s toy, even more so than any of the Game Boy or DS releases. I know that sounds crazy but I never saw an adult with a PSP. There is a certain stigma etched in my mind that Sony handhelds are meant for kids. Hopefully the Vita will change my own perception, but I’ll need to get my hands on it before I make any hard-line decision. I think as of now I’m more interested in getting a 3DS if only to make myself an utter hypocrite because of the things I’ve said in the past. We’ve always said that we reserve the right to change our minds, even if it makes us out to be idiots. We are proud of that fact. And maybe one day soon I’ll be a proud owner of one of the handhelds either out or soon to be on the market. Laugh at me when you see me in public trying to save the world, but I’ll be getting the last laugh as I game wherever I want. You’ve got some interesting points there Cole. And like you, I didn’t play the majority of DS games on my DS lite. Most of the titles I ended up purchasing and playing were GB Advance games, Golden Sun, various incarnations of Final Fantasy, Mario Kart (when you beat it, you unlocked the tracks from Super Mario Kart. Utterly badass). The DS games that I did play were very few, and very specific.. the 2D sidescrolling Castlevanias, DQM Jokers (which I regret) Contra 4, and various Mario titles. Like you, I could not bring myself to play the PSP. Partially because I haven’t owned a Playstation since PS1, partially because I didn’t like the stupid little thumb stud that had a history of snapping off, and partially because most of the games (at release) were more flash and graphics than substance. The stable of games over the next couple release periods tended to follow the same trend. And sure, you can say the same with the DS releases, but it was easier to tell which was garbage on the DS because it wasn’t meant to be a handheld graphical powerhouse. You either had intriguing gameplay, or you had bunk. I haven’t paid too much attention to the new slew of handhelds coming out this year.. if I need a momentary distraction my Droid seems to keep me entertained, and if I want to game, I have my 360. I feel like a lot of what handheld games used to deliver seem to be lost. I mean, I can recall many a contented hour wasted playing Link’s Awakening on my old Gameboy and can honestly say that I haven’t invested that much time in a handheld game since. Oh, and one side note for you.. I would consider purchasing the Wii version of Mario Kart. It is my second favorite behind the Super Nintendo version. Solid game, tons of fun. I’ve had a soft spot for handheld gaming ever since the Atari Lynx (which I still have somewhere). I agree the GBAsp was probably the pinnacle of handheld design; compact, elegant and with plenty of quality titles. These next-gen devices dont interest me, I’m no longer interested in spending 10-100’s of hours and $50+ on a single title, Android, iOS and (open source handheld) retro gaming are good enough for quick gaming fix now and then. Sony’s ploy of promising much (as in “potential”) and delivering little put me off the mainstream gaming scene.